I got up early today in hopes of having time to make a super-awesome vegan lunch to bring to work. 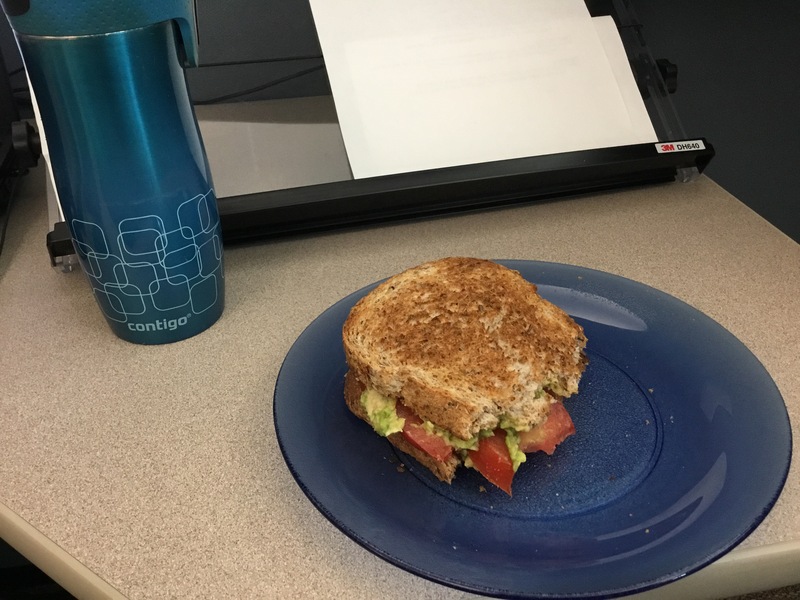 But, despite getting up early, I ran out of time and was forced to think fast and throw some random crap in my bag: two slices of Silver Hills flax bread, a whole avacodo, a whole tomato and a container of hummus. I meant to take some of my vegan cookies but, sadly, I accidentally left them on the counter. Anyway, I didn’t bring a super awesome lunch…but I made one at the office! This toasted sandwich had half an avocado (mashed), a whole tomato and some hummus. It was amaze-balls in all its glory. True story. Supper was both a success and a failure. 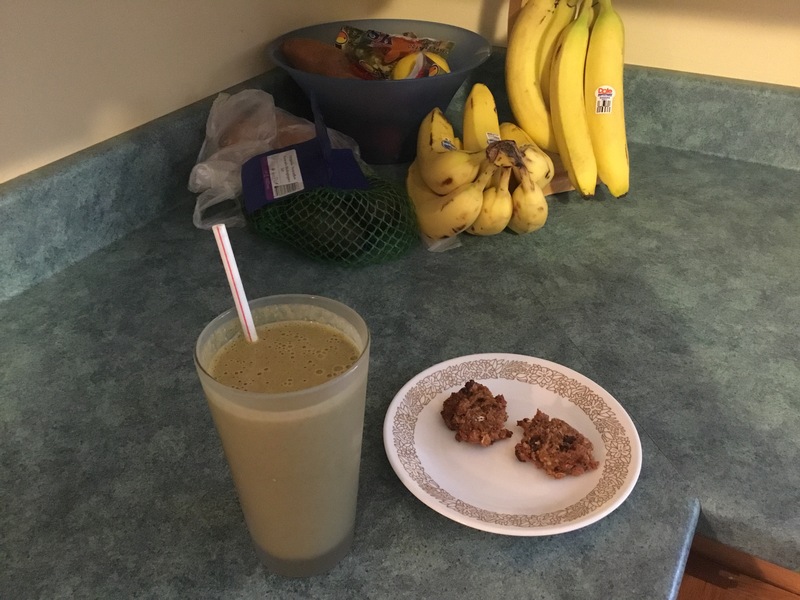 I found an intriguing recipe over at My Plant-Based Family. I’m loving this website for simple meal planning ideas. This particular recipe looked super simple, and it was. As soon as I got home, I threw a pot of water on the stove to boil. 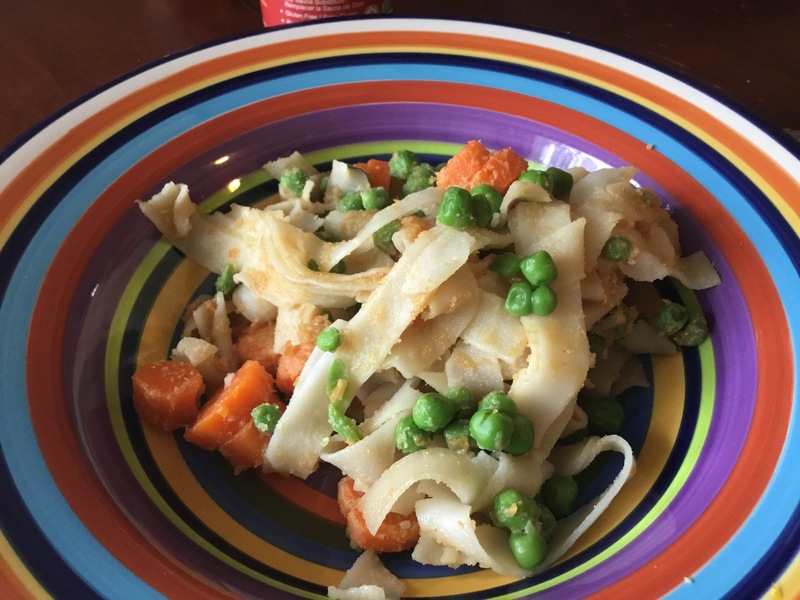 Then I peeled and sliced some carrots, grabbed some frozen peas and some rice noodles. 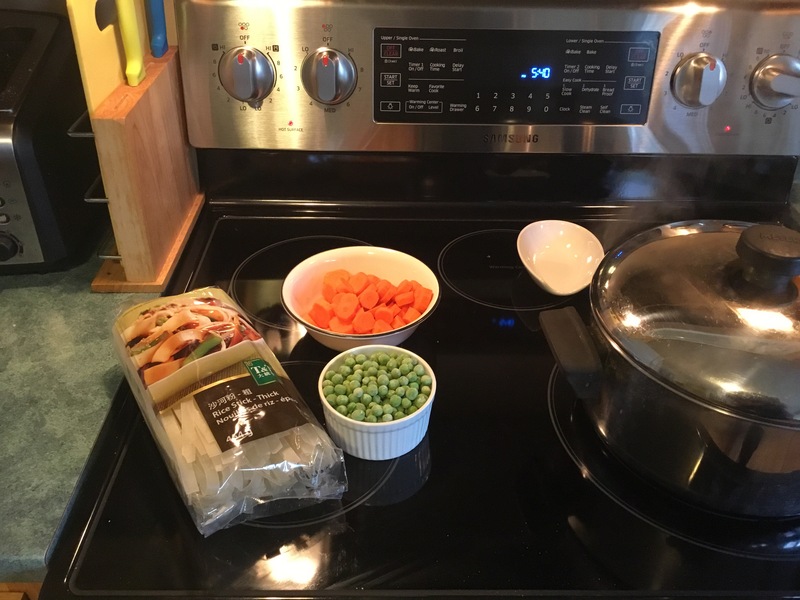 Once the water was boiling, I dumped the carrots in and let them cook for a few minutes. 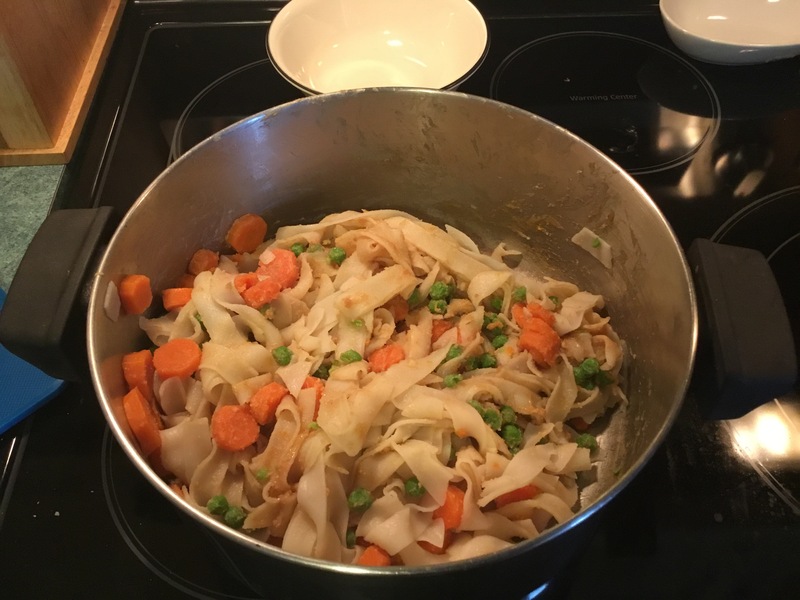 Then I dumped in the peas and rice noodles and cooked it all together for five more minutes. While that stuff was cooking, I measured out a half cup of peanut butter and got my “healthy soy sauce” ready. Note, the author of the recipe uses soy-nut butter because she has a family member with a nut allergy. I am a peanut butter fanatic, so I used the real thing. After five minutes of cooking everything together, I simply strained the contents of the pot then added the peanut butter and a couple of teaspoons of healthy soy sauce. From start to finish, this recipe took about 15 minutes. You just cannot beat that in terms of simplicity. And, it tasted fantastic! 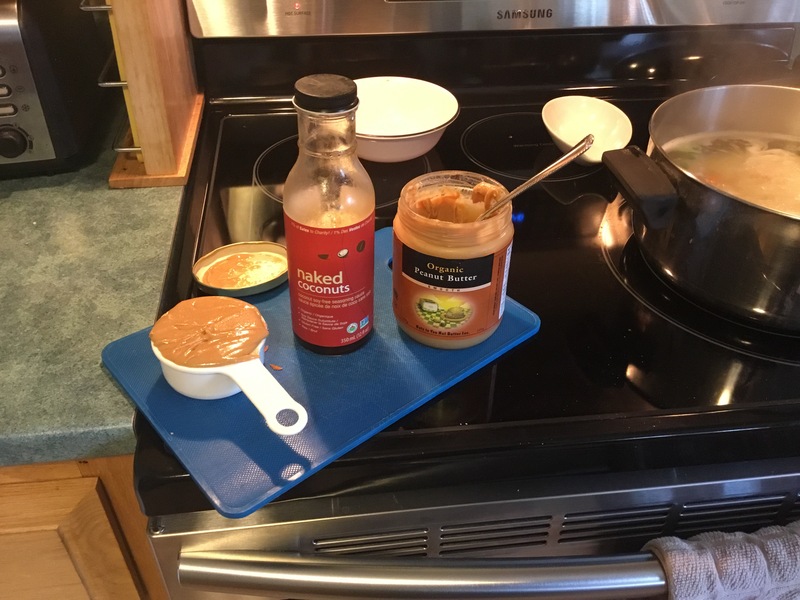 I did add a couple of extra capfuls of my Naked Coconuts sauce to my dish to dilute the stickiness of the natural peanut butter. It was so good, I had seconds! My husband also enjoyed it…although he did mention that it would be extra delicious with chicken. Sorry, Hun! The kids, however, were not fans of the peanut butter. My five-year-old had a few bites and said at first that he liked it, but then looked at me and politely said, “Mommy, this actually tastes gross.” Sigh. Next time (and there will definitely be a next time) I will take the kids’ portions out of the pot before I add the peanut butter. I am sure they would have eaten this plain with just a little soy sauce added. Also, you could use any kind of homemade or pre-packaged sauce with this that you like – Thai sauce, teriyaki sauce, etc., and you could add different veggies, too. All-in-all, this is a very versatile and super-fast dish that I am sure will become a staple! Next up, while my husband took our son to soccer, was an adventure in frozen treats from my daughter. 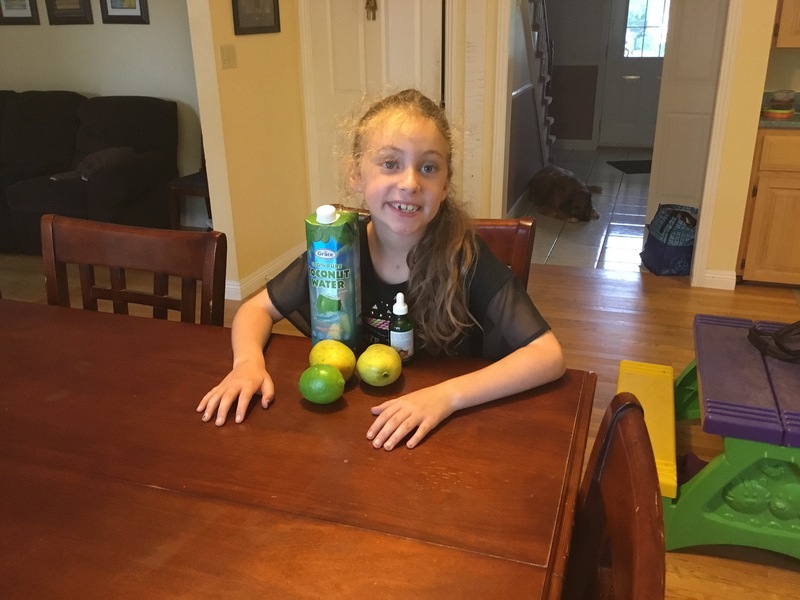 We used another recipe from My Plant-Based Family (seriously…great easy ideas over there!!). 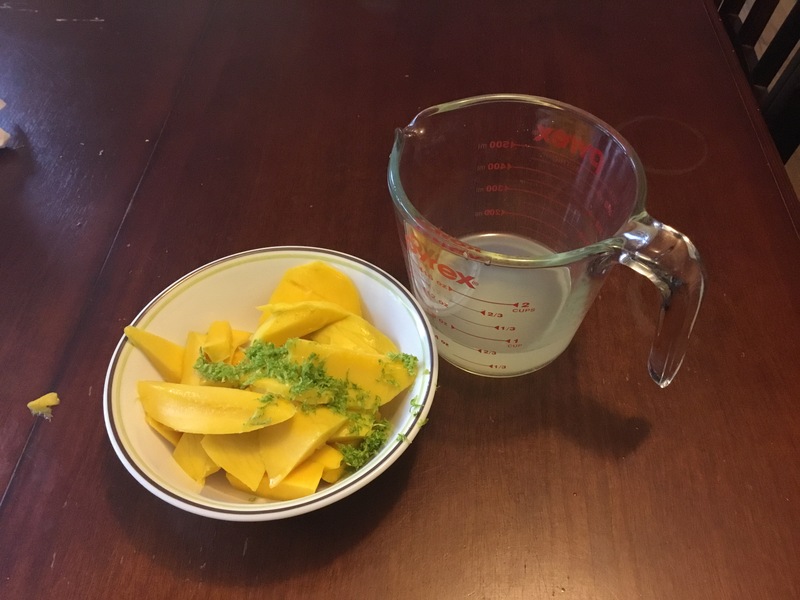 Using just two mangos, a lime, some coconut water, and stevia, we made something delicious (hopefully)! 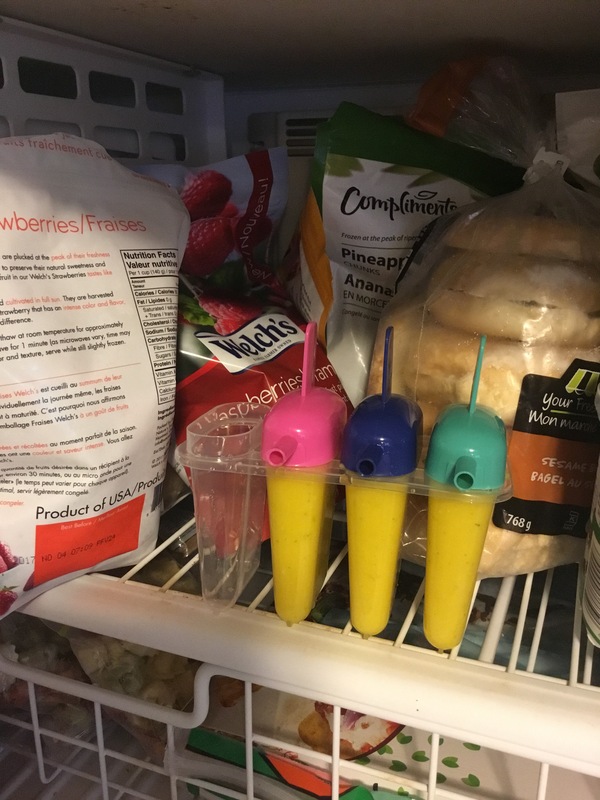 Unfortunately, the recipe only made three Popsicles. If they’re delicious, I’ll double the recipe next time. I’ll also probably use frozen mango next time…I’m not a fan of peeling and slicing mango…it’s slippery! 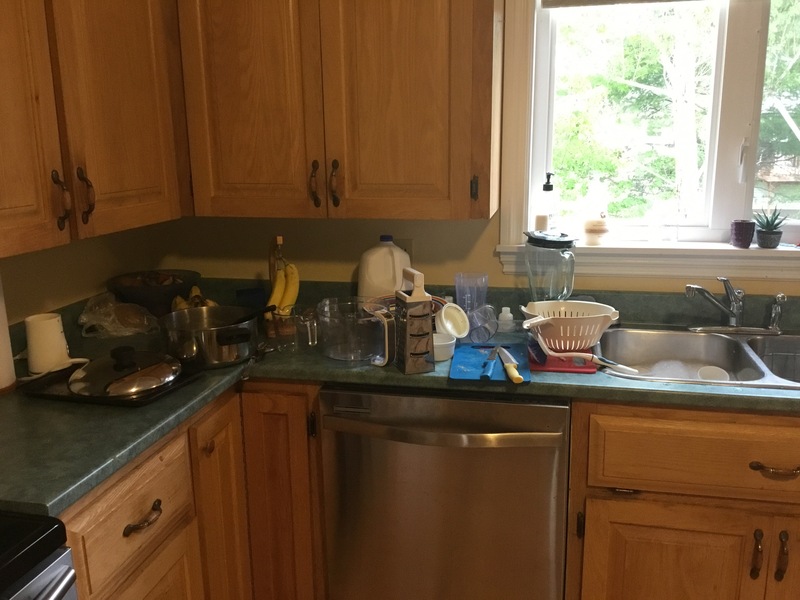 So…all this fun in the kitchen left his hella mess. It’s messes like these that cause me to give up easily when I try to implement a whole-foods meal plan. But, not this time. 1. Vegan Marshmallows in Canada? Does anyone order online? I checked at my local health food store today and they are out of stock for at least a couple of weeks. Where can I get these? It is camping season and I’d prefer to not by gelatin-filled ones for my littles…but they will insist on marshmallows. 2. Tofu? I’ve never been brave enough to try it. Should I dare? Is there a recipe or no-fail great way to cook it that will make it delicious? For meals like the one I cooked tonight, I’d love to have a protein replacement that tastes great so my husband does not feel the meal was missing something. Tomorrow, I plan to repeat breakfast and lunch from today. As an aspiring minimalist, I like to keep things simple. And, I don’t want to work so hard in the beginning that I get overwhelmed….slow and steady wins the race. 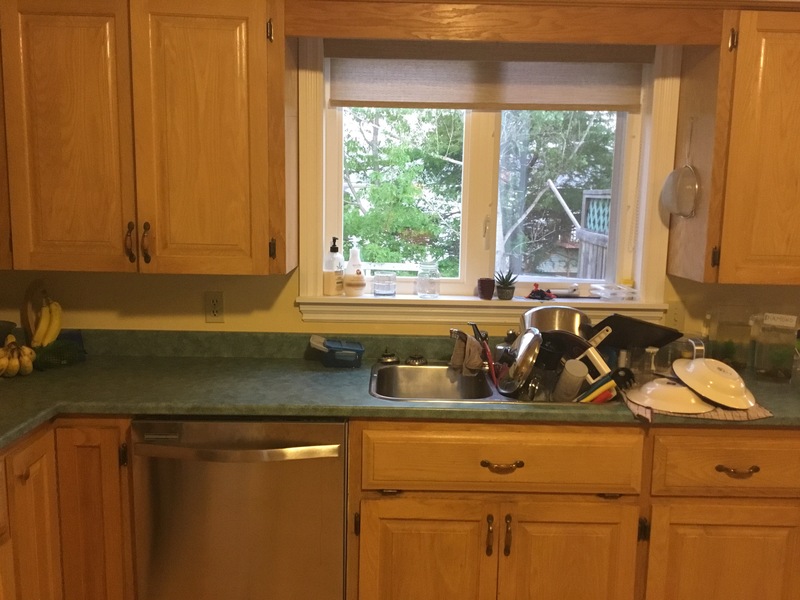 < Previous Veganism Day Two – Lots of Success and One Little Oops!